Most of my friends know that I don’t especially love reading non-fiction. When I pick up a book, I usually prefer to escape the real world and go to a fictional place. But a dear friend from childhood – the friend I totally and completely bonded with in fifth grade because we both loved reading and loathed field day in equally passionate measure – has enthusiastically taken up with camping and hiking. For months, she kept telling me to read Jennifer Pharr Davis’ Becoming Odyssa, a book Davis wrote after hiking the Appalachian Trail. I figured I’d get around to reading it some day. She had me hooked. That was the start of my adventures into trail tales. And because I surprised myself by actually enjoying a book about Strayed’s solo hike, I picked up Becoming Odyssa, too. Those of you who know me best may be wondering why I’d even read the stories of women hiking the entire Pacific Crest Trail (Cheryl Strayed) and the Appalachian Trail (Jennifer Pharr Davis), given my own aversion to lots of outdoorsy activities and critters. Like stream crossings and big spiders and a lack of hot running water. But most especially snakes. The last time I camped, 15 years ago, involved all of those things, and more. It was supposed to be a canoe trip, but, unbeknownst to my coworkers and I who ventured out with four canoes, the river was “closed” because a hurricane the year before had downed so many trees across the river. A sign saying as much at the place where we put in the canoes that morning would have been quite helpful. Just sayin’. I learned a new word that day: portage. We had to portage the canoes 13 times that day (for those of you even more indoorsy than I am, that means we had to carry the canoes on dry-ish land to get around the tree barriers blocking the river). Worse, we spent all day tossing large spiders that dropped from the trees back out of the canoes. The snakes really were the worst part of the day, though. Well, we weren’t a gun-toting bunch, and certainly not one of us had considered that our leisurely canoe trip might require armed protection. So we had no guns. But we came face-to-face with too many snakes to count. They were swimming in the water. They were wandering around on the land. But mostly, they were sunning themselves on the downed trees, some of which we tried to limbo under to save from hauling the canoes yet again onto land. I don’t have much in common withBecoming Odyssa author Jennifer Pharr Davis, either, other than being from the same state and sharing a common faith. But she was someone I found more likable from the outset. She was determined to hike the Appalachian Trail after graduating from college to see whether she could finish the whole trail and to learn what the trail had to teach her about herself and others. As she learned along the trail, she conveyed important lessons to all of us, whether we’re hikers or not. One of the funniest lessons comes when she’s trying to get away from an annoying male hiker who has latched onto her. She’s hiding in a strand of rhododendrons, hoping he’ll pass by without seeing her. What she learns – and conveys to the rest of us – is that hiding from problems does not solve them. It simply pushes them along to obstruct your path later on. Both stories are compelling, well-told tales of the serene silence of nature, joys and dangers discovered along the way. Both women are brave in ways I admire, possibly because I cannot imagine ever having that level of bravery. Their tackling of the trails may serve to help other women tackle their own dreams, and if for no other reason, that’s why I’m glad I read their books. Have you read either of their books? If so, I’d love to hear what you thought. I’d also love to hear your recommendations of other must-read non-fiction books. No promises, though. I hear some novels calling my name. 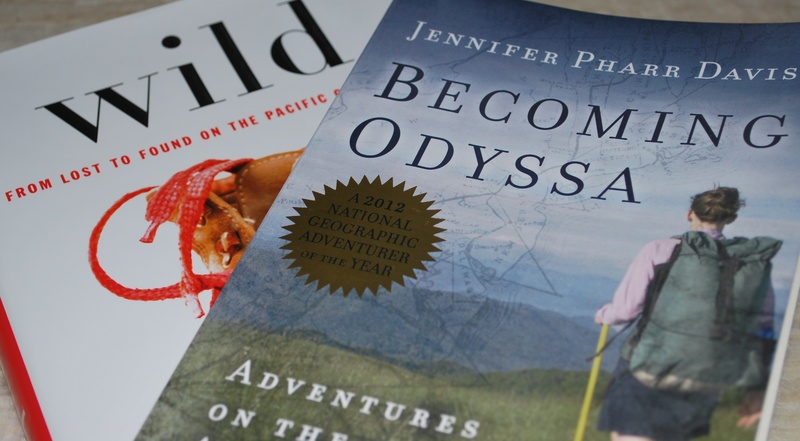 This entry was posted in flourishing tree and tagged Becoming Odyssa, books, cheryl strayed, hiking, Jennifer Pharr Davis, nature, nonfiction, trees, Wild, women by hopesquires. Bookmark the permalink. Ok, I’ll stop now. I could go on and on…. Both sound like great reads. The spiders would’ve done me in. I was going to suggest Bryson’s book but I see Jackie beat me to it! Bev — the spiders almost did me in. Believe me! But after seeing so many snakes, the spiders seemed fairly harmless. Guess it’s all a matter of perspective. I am looking forward to picking up both of those books. I adore these kinds of stories and find that people are so amazing in their pursuits. Another great Appalachian Trail read is ” A Walk in the Woods” by Bill Bryson. A semi-mid-life crisis leads a man and his high school friend on a trip along the trail. Funny, pitiful and endearing! Jackie — I can tell you, the snakes were worse. And the more snakes we saw, the more worried we were about carrying the canoe simply because we also had to watch for more snakes. Glad to hear you have a 75% positive result in your own camping experiences. Always a bonus, right? I’ll have to check out Bryson’s book. Sounds like a good read.